UV (Sunlight) RESISTANT PVC; 2.831 In. (71.91mm) LONG; TRADE SIZE 3/4 In. 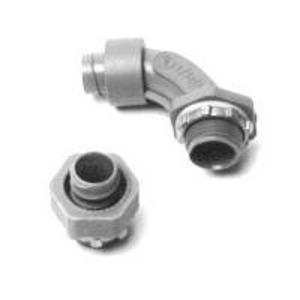 ; NON-METALLIC LIQUID TIGHT FLEXIBLE CONDUIT CONNECTOR 1 PIECE for TYPES NMUA/NMEF; NMSC9075; ANAMET CANADA INC.; CSA/UL APPROVED; EACH; 25; 1 PIECE CONSTRUCTION; GREY; 90 Deg. ANGLE; MINUS 18 Deg. C Min. ; 90 Deg. C Max.